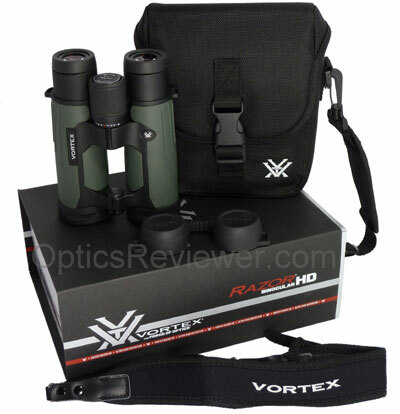 2011 Razor HD Binoculars by Vortex - High Performance Optics? December 2012 Update: Vortex introduced updated Razor HD binoculars in June/July 2012. We bought one and tested it. You can read our review of Vortex' 2012 Apochromatic Razor HD binocular to see what the current Razor HD is like. Why would Vortex put lenses made from high density (HD) glass, sometimes called "extra-low dispersion glass," (ED) into the re-designed Razor? In optics, dispersion is sometimes referred to as chromatic aberration. When viewing an image through optics with chromatic aberration, the colors are slightly distorted and show up as blurred edges between dark and bright areas of the image. This slight distortion and blurring of details is significantly reduced by using glass which has an extra low dispersion factor when compared to optical glasses with higher dispersion factors. Binoculars using lenses made from HD/ED glass provide a wealth of details, as well as enhancing colors, by reducing the blurring in the image. Will you immediately see the difference when picking up an HD binocular and quickly comparing its view with that of a non-HD instrument? The average person does see a difference, but may not immediately recognize the significance or the amount of the difference. After using HD binoculars for a period, the difference is more notable when reverting to non-HD glass as one ponders why the view is less bright, the colors less distinct, and the detail somehow lacking its "customary" resolution. Razor binoculars with HD glass have a reputation for being bright in low light conditions. We considered why this might be and believe that HD glass is part of the reason the 2011 Razor HD binocular does well in low light along with other factors we'll mention. 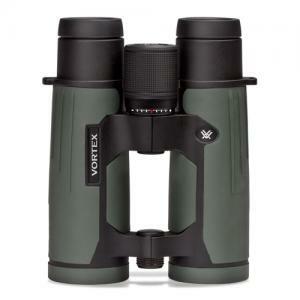 It's time for this review of Vortex 2011 Razor HD binoculars to get to specifics! As with aircraft engines, the frame on which the 2011 Razor HD binoculars are built is made of magnesium for strength and durability without weight. Magnesium is actually lighter than aluminum and quite strong. At 29.5oz/836g it's typical for instruments in its price category. At 6.5 inches (16.5cm) from objectives to oculars, it's a decent handfull of optics. As is the case with any produced goods, the 2011 Razor HD binoculars' design and construction has certain refinements which are not possible to include at lower price points. The hard rubber armoring on the Vortex 2011 Razor HD binocular is attractive and provides a certain element of hazard protection from hard bumps or scrapes. It should not be expected to prevent damage from occurring to the precision optics should the binocular be dropped or from extended periods of vibration, such as when flying. (When flying, we typically keep small optics like binoculars in our carry-on luggage until past airport security and then hang them, in their carrying case, around our neck to minimize the vibration for extended periods.) The rubber armoring does make gripping the instrument easier and more comfortable during inclement weather and is a worthy feature in such conditions. Whether or not thumb indentations are desirable is usually a matter of preference and the 2011 Razor HD binoculars tested did not have them. We found the grip comfortable without them and it was easy to position our hands so one or the other, or both, of our index fingers rested naturally on the focus wheel. While it may seem like a minor matter to report on, those who've used binoculars with difficult to reach focusing wheels value knowing this structural element. The open-hinge design of the Razor has found a number of supporters, although we feel the hinge design is less critical to usability than general ergonomics. The balance of the Vortex Razor HD 10X42 binocular was good. Extended forays into the field did not leave our hands and arms feeling particularly fatigued nor was it clumsy to handle. The 2011 Razor HD binoculars are waterproofed through the use of O-rings used to seal the critical junctions and will not allow water or dust, depending on your environment, to enter the instrument. It's also internally fog-proof due to having purged potentially moisture-laden air molecules from the instrument, replacing them with argon gas prior to sealing/waterproofing. While you may note fog forming on exterior lens surfaces when changing from an air conditioned to a humid environment or putting the oculars to your eyes during cold weather, fog will not form on the more critical, interior lens surfaces. Besides preventing internal fogging, purging potentially moist air from the binocular helps to prevent fungal growth on an instrument's internal lens surfaces. Once they start, fungi will etch lens and prism coatings and, if not killed, will eventually etch the glass itself. If you live in a particularly humid climate, you may wish to visit a photography shop to ask how they recommend that photographers protect their high-value lenses in your area. The 2011 Razor HD binoculars' twist-up eyecups are more durable and have greater adjustability than those typical of lower price points. The cups are metal-reinforced and have four increments of about 4mm each with distinct stops at each increment to accommodate all eye relief needs. We had no trouble with the eyecups unintentionally "self-adjusting." It's good to have this much adjustability with the 2011 Razor HD 10X42's 18mm of eye relief. The eyecups are comfortable to use. Actually, that's not going far enough - they adjust with a smooth precision that's a delight to use and what you'd expect of this caliber of glass. Any observation activity that includes substantial focusing and re-focusing, such as conducting a bird census (bird watchers will know what we mean here), watching a fast-paced track event, or visually tracking things or people moving quickly, for example, is tiring over an extended period. For this reason we greatly prefer a binocular with a fast focus defined as moving from close focus to infinity in one full turn of the focus wheel. We will accept one and a half turns of the focus wheel as reasonable. The Vortex 2011 Razor HD 10X42 binocular we purchased for this review moved from close focus to infinity in one and a half turns of the focus wheel. The focus wheel is comfortably large. Perhaps it was due to the lubricant or perhaps it would loosen up with more use, but there was more resistance to the focus wheel than we expected. Not enough to call it "stiff," but too much to call it "buttery smooth." While it's our only complaint about the 2011 Razor HD binoculars so far in this review and it's already loosened up from when we first started using it, this could be a point of interest if it doesn't get just a bit smoother with continued use. Our Vortex 2011 Razor HD 10X42 was stamped with its serial number and the inscription "Made in Japan." We found its mechanical construction to clearly exceed average and, other than the unexpected focus wheel's resistance, we found the mechanical and construction elements as one would expect in a precision instrument. Let's move this review of Vortex 2011 Razor HD binoculars from the chassis and body aspects to considering their optical configuration and performance now. How Large is the 2011 Razor HD's Field of View? In the past many wildlife observers, including bird watchers, and other general optical users, have felt that 8X magnification provided an ideal balance of 1) the desire for a larger image which would provide more detail, and 2) the desire for large field of view that would provide a reasonably large area of observation. As one of these two items increases, the other generally decreases as a function of physics. (The exceptions are those binoculars which have a more sophisticated lens to provide a "wide angle view.") It's understandable, then, that the 10X binocular will have a narrower field of view than the 8X as a trade-off for a view of a larger image. We're unembarrassed in saying we prefer a wider field of view simply because you can see so much more. To say it differently, when you're limited to a narrow field of view you're not aware of nearby activities which you'd see with a wider field of view. 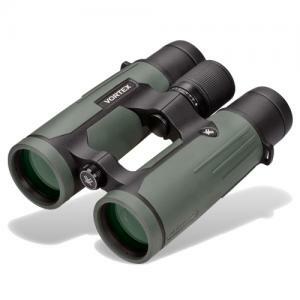 The 2011 Razor HD 10X42 binocular's linear field of view is 331 feet at 1,000 yards (110.6m/1,000m). That's on the high side of average, but we'd frankly like something a little wider! Nearly all binoculars have an optical "sweet spot." That's the area, usually in the center of the field of view, where the clearest, crispest, cleanest view is to be found. As you move away from the sweet spot toward the periphery of the field of view, there is a point at which you begin to notice the view begin to get fuzzy and blur. 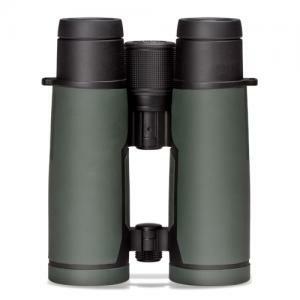 The 2011 Razor HD 10X42 binocular we tested had a large sweet spot and a desirable flat field of view. When using testing devices we found that it presented a clear, sharp view for about 95% of the field of view before we noted details blurring and even then the blurring was not significant. We were quite favorably impressed with the view provided by the 2011 Razor HD binoculars. Why do the 2011 Razor HD binoculars provide such a good view? We believe there are several elements that work together to achieve it. All air-to-glass lens surfaces are fully multi-coated - a basic, but important, point. We believe these items work together to present a particularly crisp, clear, clean view. What about chromatic aberration? We were not able to induce significant chromatic aberration with the 2011 Razor HD in the field. As is the case with most binoculars currently produced, we found that our Vortex 2011 Razor HD 10X42 binocular was designed to have a very small amount of pincushion distortion in order to avoid the "rolling ball" distortion or "globe effect." People who are able to see rolling ball distortion (not all can) will be able to use the 2011 Razor HD binoculars without suffering any ill effects. You'll not be able to discern the pincushion distortion during field use. To adjust the diopter with a 2011 Razor HD you pull the focus wheel gently up toward the eyepieces until it pops up. You'll see the diopter setting markings with a red dot marking the center and you can then turn the focus wheel several clicks to the left or right. When you've adjusted the focus for your eyes, push the focus wheel back to lock it and the focus wheel will resume its normal function of focusing the binocular. This is a refinement that you would expect at this price point and it functions smoothly. The exit pupil of 4.2mm for our test unit will work for most people on land. You'd want a larger exit pupil for use on marine vessels to accommodate vigorous pitch and yaw while keeping an image in view. What about Colors and Chromatic Aberration? We did not observe chromatic aberration either while testing or under field conditions. Given the quality of the Razors, we compared them to some of the so-called "alpha" binoculars (Swarovski and Zeiss models) in addition to others. The 2011 Razor HD binoculars' optics appeared to not have a perceptible effect on viewed colors and it was not difficult to tell the difference between shades of color. What we did notice was that the appearance of the paper we used for some of our test charts made it look as though the 2011 Razor HDs had a slightly dark or perhaps even yellow bias. Why would that get our attention? The paper we use for test charts is very white and bright compared to what is used in most printers and copiers. For those familiar with the paper industry, it's measured as GE Brightness 99/ISO Brightness 112/CIE Brightness 169. After further tests we concluded that the 2011 Razor HDs did not have a color bias, but, while very good in their own right, were simply not quite as effective at transmitting light as the alpha binoculars (priced about double the Razor HD's price) we were using as references in this area. Is this likely to be a bother? It's quite unlikely that you'd ever notice it in use. The Vortex 2011 Razor HD 10X42 binoculars' hand-selected prisms with dielectric coating, fully multi-coated surfaces, and premium grade high-density lenses to push back into the shadows quite effectively. Quite likely the proprietary anti-reflective coating also played a role. Of course, the 2011 Razor HD binoculars are not "night vision devices," but we noted that they made very good use of reasonable amounts of available light at night and were clearly preferable to the naked eye. As discussed above we found that the 2011 Razor HD binoculars, while very good in their own right, didn't transmit light quite as effectively as high-end models costing significantly more. It's unlikely that you'll notice this in the field unless doing side-by-side comparisons under very low light conditions. What is the Result of Using the 2011 Razor HD in Strong Light? Looking through the objective lens it's possible to observe the baffling inside the barrels to reduce or eliminate the amount of stray light that might otherwise be reflected inside the barrels and interfere with a good viewing experience. Such baffling is an integral part of the design of a good binocular's optical system. We tested the 2011 Razor HD optics' ability to control stray light by focusing on bright lights illuminating an area where cars were parked at night. We observed a very minimal number of short- to medium-length spikes. We believe the baffling is both designed and implemented effectively and accounts for our not observing reflected light glare when viewing in the general direction (perhaps 35-45° away from the sun) the rising or setting sun or focusing on waterfowl resting on open water during sunrise - a time when we're typically able to see problems if they exist. How Short is the Razor HD's Close Focus Distance? The specifications for the Razor HD 10X42 configuration indicate an 8 foot (2.4m) close focus distance. When we checked ours, it was 7.3 feet (2.2m). Eight feet is what we consider ideal for bird watchers. The 2011 Razor HD looks good in this area, too. Also in the Vortex 2011 Razor HD's box was a soft black nylon carrying case with about a quarter inch (6mm) of padding which felt similar to the closed-cell foam used for notebook/laptop computer travel cases. A shoulder strap, which clips onto the sides of the case, is included and there are two, sturdy belt loops sewn on the back of the case. There is a little room to spare in the case and might be enough to accommodate a slender bird guide. What's Provided for Covering the Lenses? The Vortex 2011 Razor HD binoculars come with a rain guard for the oculars which is made of a softer, durable-feeling rubber that's about an sixteenth of an inch (1.6mm) thick. It has a flexible bridge between the two caps that fit over the oculars. The caps that fit over the oculars appear to have a slight taper so that, while they fit easily, they don't usually slip off unexpectedly. The caps measure about three quarters of an inch (19mm) deep. Covers are also provided for the objective lenses and appear to be made of the same quality of rubber as the rain guard. They fasten to the binocular by means of a loop sliding over the end of the barrel - from which the lens covers hang when not in use. We like the quality of these lens covers, but we're also mindful of the probability of their getting lost during an active day outside. We found that sliding them off at the start of a field trip and tucking them into the carrying case saved them to protect the lenses at the end of the day. Also included with the Vortex 2011 Razor HD binoculars you'll find a comfortably padded neoprene neck strap. A lens cleaning cloth was part of the package - a nice touch for when you need something in the field and nothing else you have with you will quite do. (We prefer using a lens brush and, if necessary, lint-free wipes with isopropyl alchohol.) And, finally, an instruction pamphlet which describes a variety of important things such as adjustments to the instrument's eyecups, interpupillary distance, and diopter. It also gives good lens care guidance. What's Our Recommendation Regarding the 2011 Razor HD? Although the focus wheel resistance was more than we expected to find, we believe that it will continue to become smoother with use. If it doesn't, Vortex has an enviable reputation for customer service and we're confident they will ensure that it works smoothly. If the field of view were a little wider, we would be a bit more enthusiastic, but we recognize that the 2011 Razor HD 10X42's field of view is in keeping with the majority of other 10X42 binoculars on the market today. Overall, we believe the Vortex 2011 Razor HD to be a good value and provides healthy competition in both quality and price to long-established, upper-tier binoculars. We recommend it as a high quality, precision, optical instrument. Are they worth the price? They are priced much more competitively than others in the top tier league, but whether or not any binocular at this build and optical level is worth the price comes down to a personal decision. We suspect that many will find the 2011 Razor HD quality and price combination irresistible. Vortex refers to its optics warranty as its Very Important Promise (VIP) to its customers. It's fully transferrable should you give or sell a Vortex binocular to someone else. You won't have to worry about where you put the registration card or receipt because you'll be able to obtain warranty service simply because you own a Vortex instrument. Vortex will, at its option, repair or replace a damaged binocular. There aren't a lot of warranties like that. A number of vistitors to OpticsReviewer.com wondered how the 2011 Razor HD compared to the Viper HD. Similarly, others wondered what the Viper HD and Talon HD would look like when compared and contrasted with each other. We put together a summary, leaving out most of our opinions and what we considered to be interesting things that are in the full reviews, and tried to present just what we felt were the more significant things we found in working with the Talon HD, Viper HD, and the 2011 Razor HD. If you're wondering what's in that comparison, you can read it in the Talon HD vs Viper HD vs Razor HD article.